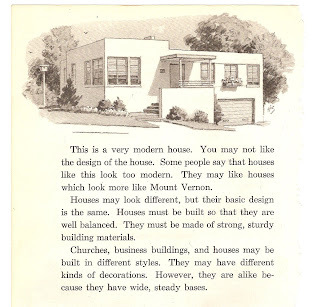 "This is a very modern house..."
Had to share this odd little snippet from a children's book from the Forties. Don't you love the second line? I mean let's not exert any influence here. Just in case you're unsure, we'll be damn sure to let you know: You shouldn't like it! Oh, and I'd say that's about the coolest little bungalow we've ever seen!